It’s been about a year since the Majacraft Aura entered my life. I picked up the box from the post office on a Thursday and rushed home to put it together. That weekend I was heading to Pittsburgh, so I didn’t have a chance to spend a lot of time with it. My first experiences weren’t great – I thought I’d put it together wrong. But, after a significant amount of panicking and reading posts on the Majacraft Ravelry forum, eventually things started to make sense. Since then I’ve focused primarily on two-ply, singles, and corespinning since that is my comfort zone. I feel like there are still so many more things to do with it, but I’m not sure how to get more information. However, it’s better knowing there is more to learn rather than feeling like I’ve already done everything there is to do. Last weekend I had the opportunity to go to The Woolery in Frankfort, Kentucky. Even though I have been buying from them for years, I never stepped into their store. It was beautiful! Not as big as I would have thought, but the staff was very helpful and pulled out all sorts of things for me to see. I had wanted to get some gadgets for my Aura such as a smaller whorl or possibly the overdrive head. I ended up with the lace flyer kit, which contains the whorl, flyer, and two fat core bobbins. Also, I picked up some cotton and cashmere for blending, linen yarn, hemp fiber, a fox/wool bend, and a Nancy’s Knit Knacks Lazy Kate. Oh yes, and two yards of gorgeous wool fabric. The night we got home, after unpacking, I tried out the new lace flyer. Taking off the standard whorl/flyer and switching to the lace whorl/flyer was very easy. 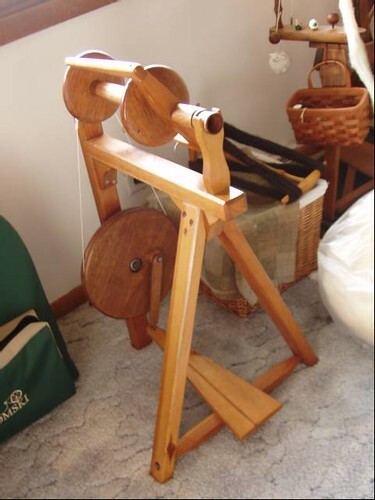 Once everything was attached and adjusted, I spun a little bit of wool. And whoa! I couldn’t believe how fast it went! 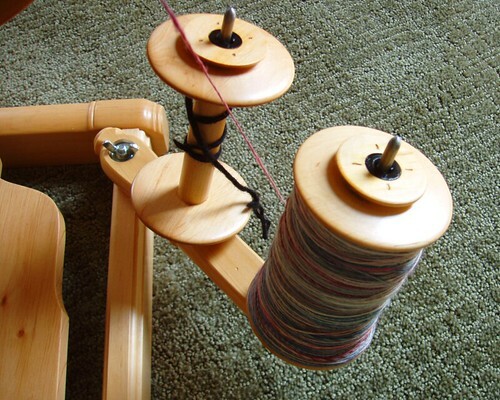 The yarn was the thinnest I’ve ever spun on a wheel. You really have to back off on the tension and the treadling isn’t quite as effortless as when you use the standard Aura flyer/whorl, but it was still pleasant and successful. 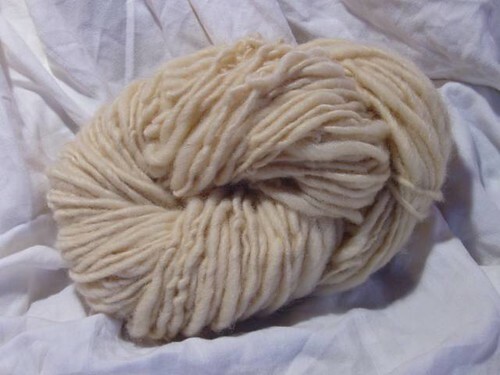 After that initial test run I spun a few other experimental things before settling on some black alpaca. I put the drive band on the highest whorl and went from there. Of course it’s not perfect, but I still feel pretty happy with it. Right now I am waiting for an Akerworks Majacraft Baby Bobbin to arrive before plying these together. I discovered that plying onto my jumbo bobbins with the low whorl presents challenges, so I took the opportunity to finally get an Akerworks bobbin. More to come! 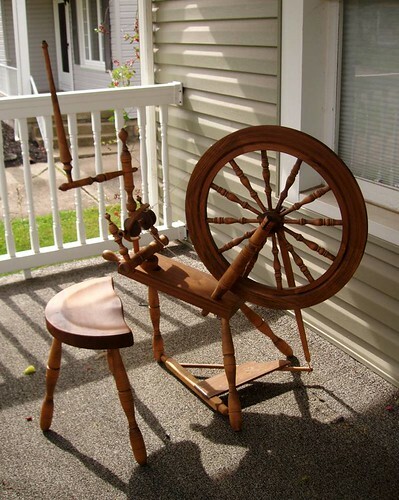 I love to sit on the front porch in the summer and spin. And if I could do it more often, I would go to an alpaca farm and set up right next to the pasture where the animals are grazing. But under normal circumstance, I spin in the living room. I’ve found that I am most productive if I keep my wheel in a place where I already spend a lot of time. It used to sit at the picture window when I lived with my parents. I enjoyed the view, but I was always removed from the family when they were downstairs watching TV. These days Rich has his hand on the remote control and I can focus on the spinning without being alone in another room. If I was there by myself, I’d put on a movie or music so I wouldn’t be tempted to continually change the channel on the TV. Sitting in absolute silence is not appealing to me, unless I can enjoy the sounds of nature. Question: Where is your favorite place to spin? Where is your most productive place to spin? Do you play music or put on a movie? Do you prefer to sit in silence and meditate solely on the wheel? Newsflash! I have a short attention span. And that might just be the main reason I end up spinning fat yarn… because I can’t be bothered to take the time to spin finer. Plus I don’t think I treadle fast enough even on the highest ratio. Which is why I am thinking about getting the lace flyer for my wheel, but I also need to use my lightweight drop spindle more often. Well, I forced myself to suffer through [merely] four ounces of Falkland, spinning it finer than normal in order to navajo-ply it and not end up with a heavy weight yarn. That bobbin is so FULL. But this one is filling up much quicker! All that time I spent collecting and stashing household goodies… it has all led to this! Rich and I are now finally settling into our little apartment. My cupboards are full of green Pyrex and I don’t have to feel guilty about decorating the living room with wool. While we were on our honeymoon, we stopped at several antique malls. 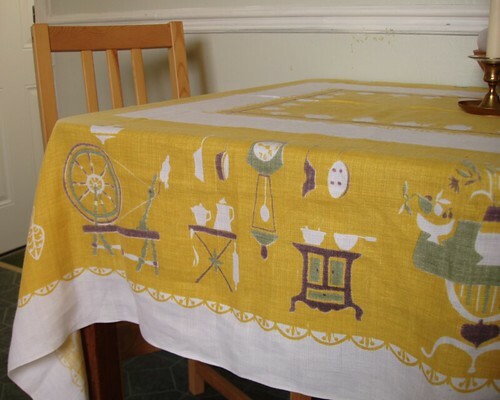 I found some special things including this wonderful linen tablecloth. During some intense browsing, I came across a pile of linens, and just happened to pull this one out without knowing its special hidden secret. A wheel! Of course I couldn’t pass up something with a spinning wheel on it! When we got home I put it on the table immediately. An unexpected bonus: it’s inspiring me keep the table clean. wee! 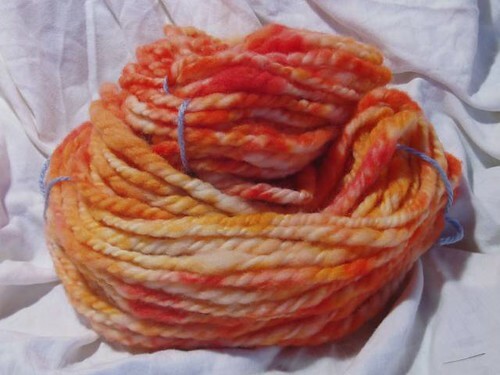 I just ordered my Kromski Sonata jumbo flyer from Paradise Fibers! Plus an extra bobbin, that put me over $100 and I got free shipping. The best deal I could find. I’m excited at the prospect of not struggling with fitting yarn onto my bobbins. Hoobah! This guy ended up in my photostream February 19, but I didn’t say anything about it. It’s a Country Spinner and it belongs to Cosy. I took it home after a day of spinning to see if anyone in Ohio could get it working. Treadling was more or less impossible, the wheel is warped, and the driveband kept slipping. I told my dad to consider making a new wheel, which seemed doable to him. In the meantime, though, Richard had a closer look at it. And he put a rubber band around the bobbin, where the driveband was slipping. Amazingly, it worked! (Note: I am not amazed that he fixed it, I’m amazed it was that simple. He was offended that I thought he couldn’t fix it). Which leads to these two gigantor skeins of yarn. They are both the weirdo free wool from Indiana that I wasn’t sure what to do with because it’s short and obnoxious. Apparently spinning it huge is the solution. The 2ply I dyed with koolaid after spinning. It weighs 4 ounces and could be 50 yards (I don’t remember). The natural singles weighs a whopping 7 ounces! Maybe 100 yards? 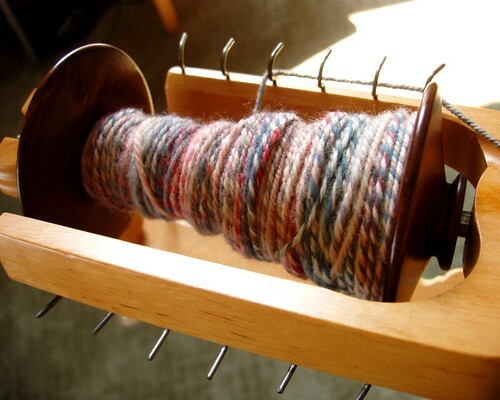 I think I’ll just spin the remainder of the fiber as such.